This PDF 1.6 document has been generated by ILOVEPDF.COM, and has been sent on pdf-archive.com on 23/08/2015 at 15:29, from IP address 103.5.x.x. The current document download page has been viewed 326 times. File size: 348 KB (17 pages). executable programs, numeric data, payroll recorder, graphic images, sound recordings and so on. Text file:-Text file is a sequence of characters organized in to lines. as declaration followed by executable statements. Name:-The symbolic file name is the only information kept in human readable form. Identifier:-The unique tag, usually a number, identifies the file within the file system. It is the nonreadable name for a file. Type:-This information is needed for those systems that supports different types. Location:-This information is a pointer to a device and to the location of the file on that device. Size:-The current size of the file and possibly the maximum allowed size are included in this attribute. Protection:-Access control information determines who can do reading, writing, execute and so on. last use. These data are useful for protection, security and usage monitoring. 1. Creating a file:-Two steps are necessary to create a file. First space in the file system for file is found. the file and the location in the file system. 3. Reading a file:-To read a file system call is used. It requires the name of the file and the memory address. location in the file where next read is to take place. all free space. That free space can be reused by another file. also known as file seeks. of the file and renaming the existing file. These primitives can be combined to perform other two operations. reaches zero to last close. having to read it from the disk for each operation. pointer. This pointer is unique to each process operating on a file. system must wait for the last file to close before removing the open file table entry. stored on per-process table the OS can allow OS deny subsequent i/o request. file can be next to the beginning. Sequential access depends on a tape model of a file. 1. Disks are split in to one or more partition also known as minidisks. operations that are to be performed on a directory. to be able to find all the files whose name match a particular pattern. x Create a file:-New files can be created and added to the directory. x Delete a file:-when a file is no longer needed, we can remove it from the directory. entry for each file in the list. changed. Renaming allows the position within the directory structure to be changed. 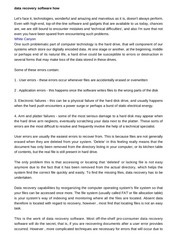 when the system gets fail or when the file system is not in use. directory which is easy to support and understand. users. The solution here is to create separate directory or each user. (UFD). Each UFD has a similar structure, but lists only the files of a single user. to the UFD for that user. may have files with the same name. x To delete a file checks in the local UFD so that accidentally delete another user’s file with the same name. disadvantage. This structure isolates one user from another. This isolation is an advantage. current directory to be the directory currently holding that file. directory names on the path. low to handle the deletion of a directory. a. If a directory is empty, its entry can simply be deleted. b. If a directory is not empty, one of the two approaches can be used. i. In MS-DOS, the directory is not deleted until it becomes empty. ii. In UNIX, RM command is used with some options for deleting directory. Same file or directory may be in two different directories. A link is a pointer to another file or a subdirectory. A link is implemented as absolute or relative path. structure but sometimes it is more complex. mounted file system will be attached. directory structure within that file system. We must precede the directory names as /home/jane. b. Then OS verifies that the device contains this valid file system. OS uses device drivers for this verification. c. Finally the OS mounts the file system at the specified mount point. write back in to same place. sequentially or randomly and switching from one file to another. containing the data usually do not match the logical numbers, So a translation is needed to locate each block. c. Directory structure is used to organize the files. blocks. In UFSinode, In NTFS this information is actually stored within master file table. a. An in-memory partition table containing information about each mounted information. b. An in-memory directory structure that holds the directory information of recently accessed directories. c. The system wide open file table contains a copy of the FCB of each open file as well as other information. a. How the file system should look to the user. different levels. Each level uses the feature of the lower levels to create new features for use by higher levels. This file has been shared by a user of PDF Archive. Document ID: 00297423.